Welterweights – Danny “Swift” Garcia faced his most experienced opponent to date in a fight that was supposed to give him some rounds, but that wasn’t the case as he knocked out “Unmighty” Mike Arnaoutis at 1:05 of the fourth round. Garcia knocked Arnaoutis down twice, the first coming at the end of the third round from a left hook, and again in the fourth from a combination. Arnaoutis has lost four in a row and five of his last six. His record fell to 22-7-2. Garcia, who improved to 19-0, 13 KO’s, is just 22 years young and has a bright future in the boxing game. Flyweights – Ring Magazine Flyweight Champion of the World Pongsaklek Wonjongkam remained champion with a hard fought twelve round unanimous decision over Suriyan Por Chokchai by the scores of 115-114, 114-113, and 115-112. Wonjongkam relied on his experience to outwork Chokchai, who wasn’t expected to put up much of a challenge. Wonjongkam is unbeaten in thirteen straight fights and improved to 77-3-1. Por Chokchai has nothing to be ashamed of. He just opened up a lot of eyes in the flyweight division based on his performance. His record is now 14-5-1. Wonjongkam is lucky to have come away with a win here. If it wasn’t for an idiotic wbc rule that takes a point away from the fighter that doesn’t get cut from an accidental clash of heads, the fight would have ended in a draw, as he was cut that way in the eighth round. I believe a rematch should be ordered immediately. Jr Bantamweights – Ring Magazine #2 Jr. Bantamweight Hugo “El Increible” Cazares dropped Alberto Rossel twice en route to stopping him at :31 of the ninth round. Cazares was in command the entire bout and he scored a knockdown in the fourth round and again in the ninth. He is one of the top boxers in the game and is unbeaten over his last seven bouts. Overall he improved his record to 33-6-2, 24 KO’s. Rossel was clearly outclassed in this one, despite coming into the fight having won six in a row. His record dropped to 24-8. I said leading into this fight that the matchup that needs to be made in the division is Cazares against fellow Mexican contender Tomas Rojas, and I still believe that to be true. 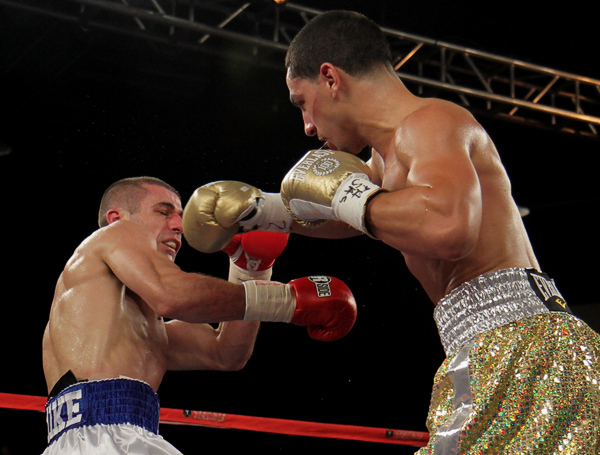 Welterweights (10 Rounds) – Danny “Swift” Garcia (18-0, 12 KO’s) will take on “Mighty” Mike Arnaoutis (22-6-2, 10 KO’s). Garcia is coming off a ninth round stoppage over Jorge Romero in July. Five of his last six bouts have been stoppage victories. Arnaoutis is coming off a ten round unanimous decision loss to Demetrius Hopkins in July. He’s lost three straight and four of his last five. The 22 year old Garcia will have the hometown advantage, and he may need it. Despite these fighters going in opposite directions, Arnaoutis should put up a challenge for Garcia, as he will be his most accomplished opponent to date. Garcia should prevail, but don’t count out “Mighty” Mike. Flyweights (12 rounds) – Ring Magazine Flyweight Champion of the World Pongsaklek Wonjongkam (76-3-1, 40 KO’s) will go up against Suriyan Por Chokchai (14-4-1, 4 KO’s). Wonjongkam is coming off a first round knockout over Rey Megrino in July. He’s unbeaten in his last twelve fights. Por Chokchai is coming off a first round knockout over Decky Putra in July. He’s won six in a row, with four of those wins coming by way of knockout. Wonjongkam is truly a wonder. He has fought nearly everyone out there in his weight class. As a 33 year old flyweight with 80 fights under his belt, one has to wonder how much gas is left in his tank. 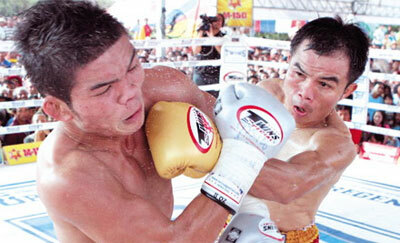 There will be enough to get by Por Chokchai, who just isn’t close to the same class of fighter. Jr Bantamweights (12 rounds) – Ring Magazine #2 Jr. Bantamweight Hugo “El Increible” Cazares (32-6-2, 23 KO’s) will fight Alberto Rossel (24-7, 11 KO’s). Cazares is coming off a seventh round stoppage over Everado Morales in July. He’s unbeaten in his last six fights and the only two fights he’s lost since 2000 were against former pound for pound elite Ivan Calderon. Rossel is coming off an eleven round majority decision over Luis Singo in July. He’s won six in a row. Cazares is a terrific fighter that won’t have a problem getting by Rossel. A great future matchup for him would be a showdown with fellow Jr Bantamweight top 5 contender Tomas Rojas.